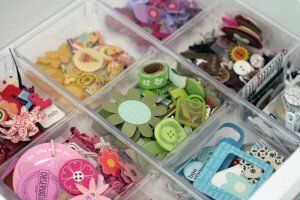 Need help organizing your scrapbooking supplies? Home > Organizing Tips > Scrapbooking > Need help organizing your scrapbooking supplies? Help is here! Here are three ways you can get help for your scrapbook organizing dilemmas so you can get back to the main event – scrapbooking with ease! On Tuesday, August 27, I got to do some on air coaching for a couple of scrapbookers whose craft areas just weren’t working well for them. There were lots of ideas and challenges that are applicable to many scrapbookers, so click here to see the before photos and listen to the show. Then, on Thursday September 12, my online class Organize Your Creative Space begins. (Update: This class is now available in self-paced format.) In this four lesson class I’ll guide you through the process of figuring out how to organize your creative tools and supplies in ways that support your own unique creative process. This isn’t a one-size-fits-all organizing class. Instead, the concepts shared in this class will help you no matter where you scrapbook – whether you have a room of your own or you scrapbook in a place that performs many functions like at the kitchen table. Plus, I’ll be there coaching you via the online forum. We’ll get to the heart of what will work for you organizationally, so you can spend more time enjoying your creative pursuits.